As I mentioned in my last recap, during the city council work session last week the city staff alerted the council to a new rail project that has the potential to significantly affect Crystal. 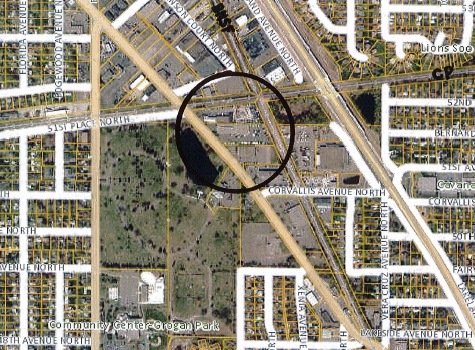 Canadian Pacific (CP) and Burlington Northern Santa Fe (BNSF) are proposing to link their tracks which currently cross at about West Broadway and 52nd Avenue. This would allow trains moving east/west on the CP line to turn and go north/south on the BNSF line. With this change we would see an increase of rail traffic through Crystal. It is expected that both the frequency of trains and the length of the trains going through would increase significantly. Some of the trains would be Bakken oil trains which can be 100 cars (or 4,000 feet- almost a mile) long. 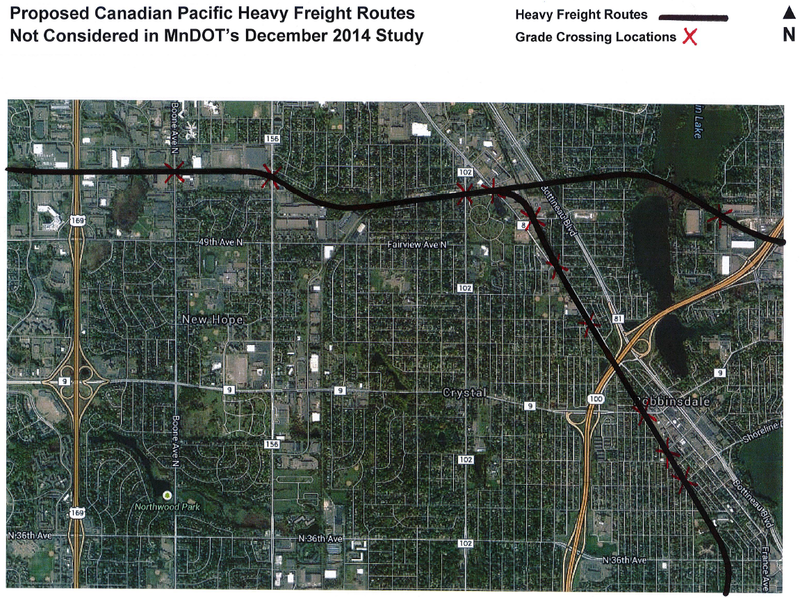 One major concern is that a single 4,000 foot long heavy freight diverted from the CP to the BNSF would simultaneously close all four of the Crystal crossings – Douglas Dr (CP), West Broadway (CP), Corvallis (BNSF) and West Broadway (BNSF). This would have an impact on our emergency services vehicles, basically cutting off the northern part of the city from the southern part of the city. So, how can the train companies plan such a project without appealing to the local community for input and approval? How can they entirely exclude our city council and staff? The Federal Surface Transportation Board and the U.S. Department of Transportation Federal Railroad Administration regulate the railroad industry. Railroad companies are afforded many liberties, which include the ability to unilaterally carry out projects without any meaningful input from the local community. The railroads have eminent domain authority, and this project would require the acquisition of at least three private businesses by the railroads. Our city staff was only alerted to this proposed project because one of the private business owners contacted the city with some questions. When this project was brought to our city staff’s attention late last year, they immediately brought it to the attention of MnDOT staff. Since then, MnDOT staff met with the railroads but has been indifferent to the city’s concerns. This morning council members from Crystal and some surrounding communities met with our legislative delegation to get an update on what’s going on in the legislature. At this meeting Senator Ann Rest shared that she had a meeting with MnDOT this week about this project, and that MnDOT had noted that there is little they can do because railroads are regulated federally. Details on where we go from here are unclear, but here’s what we do know now- the railroads will be required to complete an environmental impact statement as part of this proposal. This process will include an opportunity for public input. It’s important that residents of Crystal participate in this process. I will post more information about the process as soon as I get it. At our legislative meeting this morning we also discussed that if this project were to go forward we would need to address some of the railroad crossings in Crystal to ensure access to half the city is not cut off. Our entire legislative delegation (Senator Rest and Reps Freiberg and Carlson) committed to working with us to attempt to secure funding to implement what’s called “grade separation” on some of our crossings. That means either the road or train tracks would become elevated so traffic was not stopped by the trains. This project could also have an impact on the proposed Blue Line or Bottineau light rail, though the impact is unclear at this point. At this point I think it’s safe to say there are more things we don’t know than we do know, but I thought it was important to put this out there so people could be aware of what is going on. There was discussion today about holding a community meeting with representatives from MnDOT to answer questions, but nothing is on the calendar quite yet. I will post information as soon as I can, and if you have any questions, please let me know. Update: In response to a question on Nextdoor, here is an image of what the new route would look like if the connector was built. Trains traveling east on the CP line (which runs east-west) could turn south on the BNSF line (which runs north-south). Click the image to see full size. The Crystal City Council had a busy night on January 20, starting off with Citizen Input Time at 6:00, which was followed by 2 council work sessions, a council meeting, and an EDA work session. One person spoke at Citizen Input Time- a landlord who owns a rental property in Crystal and had some issues with the renewal process. The council and city staff will be looking into potential changes to the way we interact with property owners as a result of this conversation. The first work session, held right before the meeting and after Citizen Input Time, dealt with a proposed railroad project in Crystal. I will write about this in more detail later as I should have more information after another meeting tomorrow. After the first work session we went to the regular council meeting. We started with the presentation of the Outstanding Agency Award to the Crystal Police Department from from state’s Office of Traffic Safety. CPD participates in the state’s Toward Zero Death traffic safety initiative and a representative of that program was on hand to explain about the program and the results. We have had zero traffic fatalities in Crystal over the past few years, and deaths in MN are near an all time low. In addition to accolades, CPD won a new piece of traffic safety equipment, called a “Lidar,” worth about $5,000. During the regular agenda we approved the purchase of some replacement trucks for public works. These were planned replacements of old trucks which were in the 2015 budget. After the meeting we went into an Economic Development Authority (EDA) work session which was very productive. We reviewed the 2014 annual report and the 2015 work plan (what the EDA did last year, and what it plans to do this year). We also discussed in detail all of the lots which are owned by the EDA, and asked the staff to move a few of the lots from the “hold” list to active development. There are many reasons why the EDA may obtain a lot- it could be a tax forfeiture, a regular purchase or even a donation. Once the EDA obtains the lots we have to decide what to do with them. The city has been holding on to a few lots since the bubble burst of 2008, but with the market coming back the EDA wanted to get as many of these lots developed as the market will allow. After the EDA work session ended at about 9PM we had a short council work session to talk about council goals for 2015, including the Citizen Connection Initiative. The next meeting is Tuesday February 3. The StarTribune had an interesting article today about city council work sessions. One of the first things I learned when I started to pay attention to city government was that all of the “real” discussions tend to happen at the work sessions. Work sessions are typically held before or after a council meeting, or on a day there is no meeting, and are not held in the council chambers. They are open to the public, but are rarely attended. If you do attend, you aren’t usually allowed to speak (it’s time for the council to have discussions among themselves) but you are entitled to see any of the documents that are being discussed. Some councils encourage citizens to attend, some are openly hostile to the idea of public oversight. The latter need to be replaced by the former. In Crystal, the council began to audio record the work sessions last year and posting the recordings on the city’s website. This was a change pushed by Jim Adams Crystal Mayor, and something we will continue to do going forward. As part of the Citizen’s Connection Initiative in Crystal we will be actively encouraging the public to attend work sessions. Getting involved in your city government can sometimes seem a bit daunting, but if you have questions about attending a work session either in Crystal or in your city, let me know! The Sun Post did a write-up on the new Citizen Connection Initiative. Check it out here. 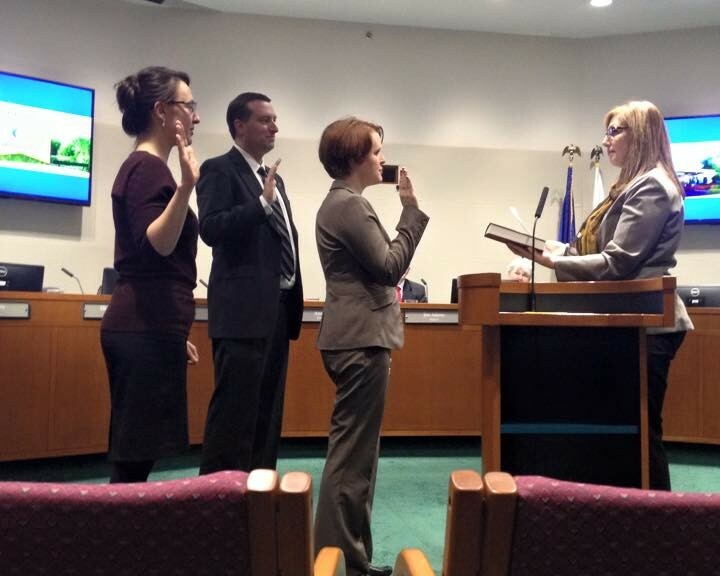 January 6 was the first meeting of the Crystal City Council for 2015, and my first meeting as a council member. It is my intention to provide a recap of each council meeting on this website. This is something I started when I was on the Crystal Planning Commission. I’ll recap the key items that were covered during the meeting and the key votes that were taken. I usually try to get these recaps done by the end of the week. The first order of business was the swearing in of the new members. I talked about that a little bit in this post. After that Liz Adams from the West Metro Fire Auxillary and Shawn Smith from the Light of Crystal presented the awards to the winners of the Crystal Sparkles holiday lights contest. If you haven’t checked out the Light of Crystal, you can see them on their website or on Facebook. They do good work in the community, and sponsor a happy hour meet-up at a Crystal restaurant/bar on the 15th of every month. After awards and presentations we move into what’s called the “Consent Agenda.” I’ll cover how council meetings are structured in more detail in a later post, but for now know that the consent agenda are items that are approved without discussion. Items can be removed from the consent agenda and added to the regular agenda, and I requested we do so with two items pertaining to the purchase of replacement police cars. I wanted to make sure we had the opportunity to ask some questions about the purchases, since they were sizable dollar amounts. After asking a few questions I felt comfortable with the process and the purchase passed the council unanimously. The next item to address was an application to move the lot line on two adjoining properties. This is probably worthy of a follow up post, so for now I will say- we had some good conversation, and ultimately voted to approve the shift, as long as some legal conditions were met. I was very glad to see neighbors at the council meeting speaking both for and against the action. Next we went on to committee/board/commission assignments for council members, which is done at the first meeting of each year. I was appointed to be the city’s representative on the West Metro Fire-Rescue District Board the city’s representative on the Northwest Hennepin Human Services Council board, and the council liaison to the Planning Commission. I was originally going to be the liaison to the Environmental Quality Commission, but due to some scheduling conflicts council member Olga Parsons and I switched assignments. We also voted to re-appoint members to the Shingle Creek Watershed Management Organization. We have our first real work session tonight at city hall, covering a whole bunch of housekeeping type things, and the next meeting is Tuesday January 20. You can watch the video of the council meeting here and find the agendas and meeting notes here. Check the city calendar for updated meeting dates, locations and times. Picture above is the 3 new councilmembers being sworn in as EDA commissioners. I’ll get into the EDA at a later date. I’m in this job for 4 years. I have to save some material for later. Crystal, MN, January 7, 2015 – Incoming Crystal City Councilmembers Olga Parsons (Section II), Elizabeth Dahl (Ward 1) and Jeff Kolb (Ward 2) are today announcing the creation of the “Citizen Connection Initiative,” a program which will guide their priorities and decision making throughout their term in office. The Citizen Connection Initiative is a program that will incorporate several steps to make the Crystal City Government more transparent, open, and responsive to its citizens. The steps of the program are a mix between things that elected officials can choose do as individuals, and initiatives that the new councilmembers will propose to the full council once they are sworn in. In addition, residents can expect to see their new council representatives at community meetings and out knocking on doors having one-on-one conversations during non-election years. Other steps of the Citizen Connection Initiative will include the proposal of key reforms to the way council meetings are structured, how city business is conducted, and how the city interacts with its residents. Discussion and implementation of these new initiatives will require the support of the full council and city staff. Residents can expect to hear more about these proposals at upcoming council meetings and work sessions. Hi! I’m Jeff Kolb and I am the new councilmember representing Ward 2 in the city of Crystal Minnesota. I will be using this site to keep the residents of Ward 2 informed about what’s going on in Crystal. If I can answer any questions for you, please let me know. My phone number is 612-314-5652 and my email address is jeff.kolb@crystalmn.gov. I am also on Facebook and Nextdoor.com. 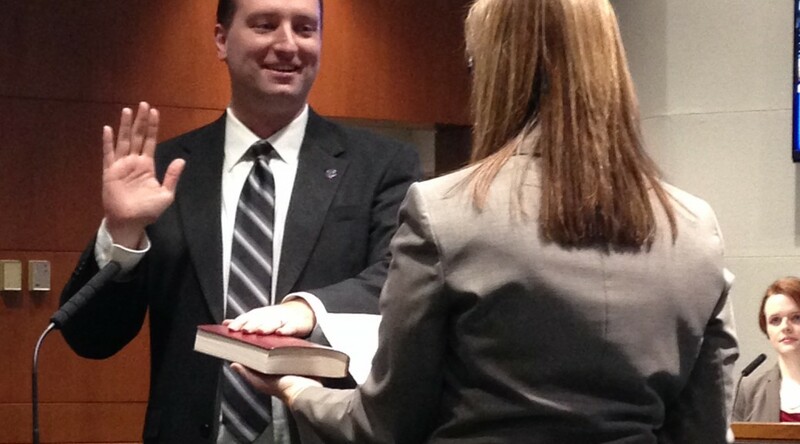 I am excited to get sworn in on Tuesday January 6 so I can get to work!